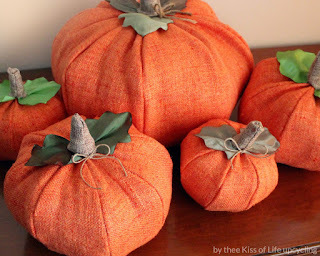 These fabric pumpkins turned out so cute. I found the perfect sized pumpkins by The Spruce. You can get their free sewing pattern here. 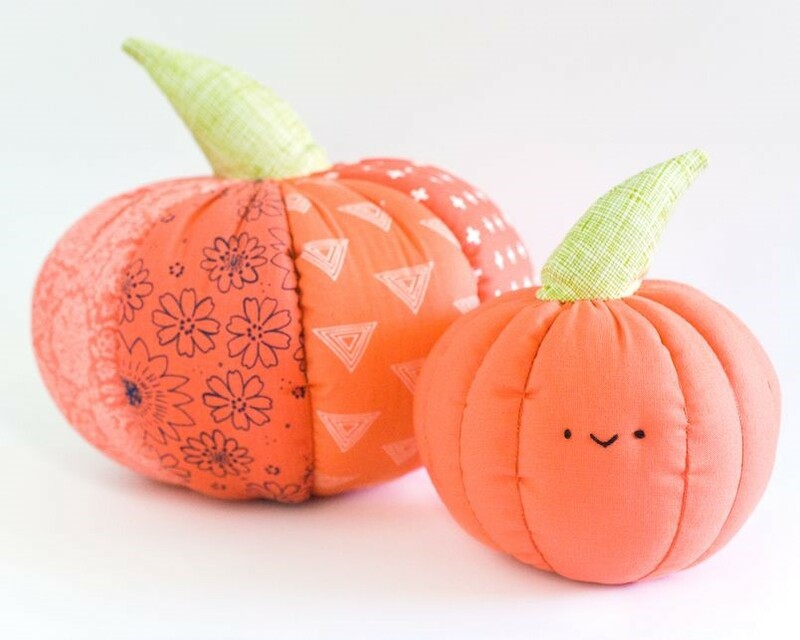 They have it titled as pumpkin pillows but if you just follow their tutorial for the body, you can add whatever type of stem you'd like and use whatever kind of fabric. I wasn't looking for pillows, more like just for decor but again the sizing of these worked out great. I took the large pumpkin pattern and scaled it up about two sizes more to make the really big pumpkin. I also found this tutorial for upcycled pumpkins. If I didn't have so much of this fabric already I would've definitely done this one. You can check out the how-to by Evie Bidell, here. 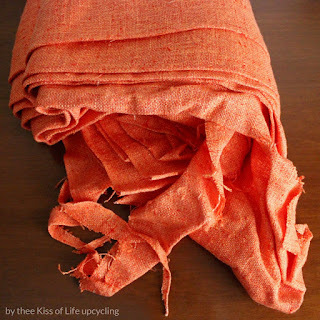 I have had this orange burlap material for years and it never occurred to me that it would be great for some fake pumpkins. It would be good for some fake carrots too but those don't really say fall as much as they do Easter. 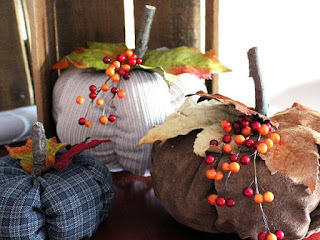 Anyway there is so much of this material that I was tempted to make huge pumpkins but then I wasn't sure where I would put them since I don't want them outside. This craft also allowed me to make use of some fabric samples that were from a company I no longer order fabrics from. 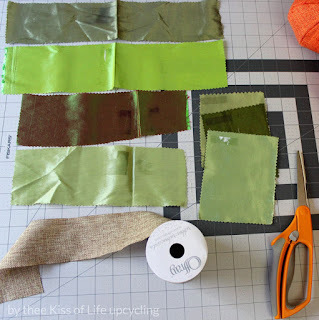 I took all the green shaded taffeta swatches and some crepe satin but only ended up using the taffeta. Taffeta is awesome to work with because it's stiff, lightweight and you can easily singe the edges. It's basically the paper of fabrics. 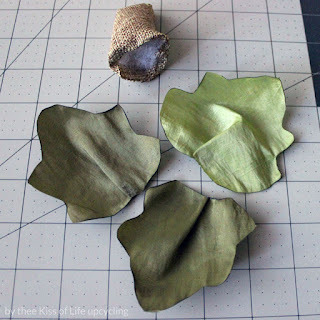 For the trunks or stems rather, I got a roll of faux burlap ribbon. I knew I only needed small pieces so I went with the ribbon instead of buying fabric. Added bonus the ribbon has sealed edges making it even easier to work with. I sort of followed the given pattern for the stems but not really because mine are not as curved nor as tall. I gave them a little stuffing too. 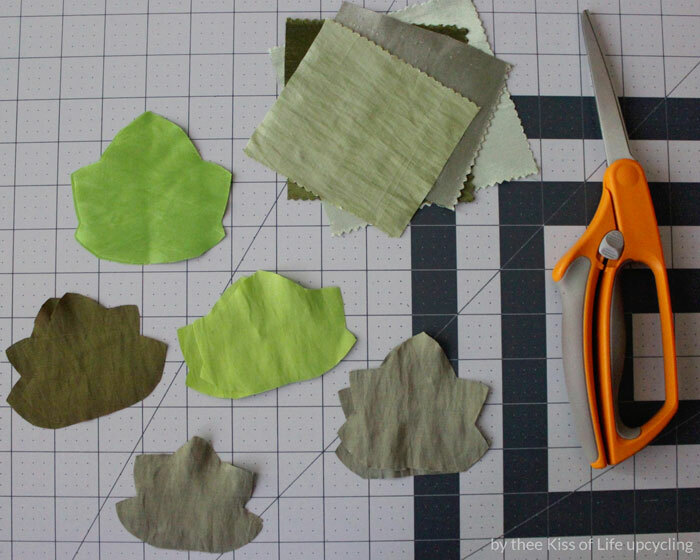 For the pumpkin leaves I cut away the pieces of swatches that had glue residue from the booklet they were in and cut out some pumpkiny looking leaves. 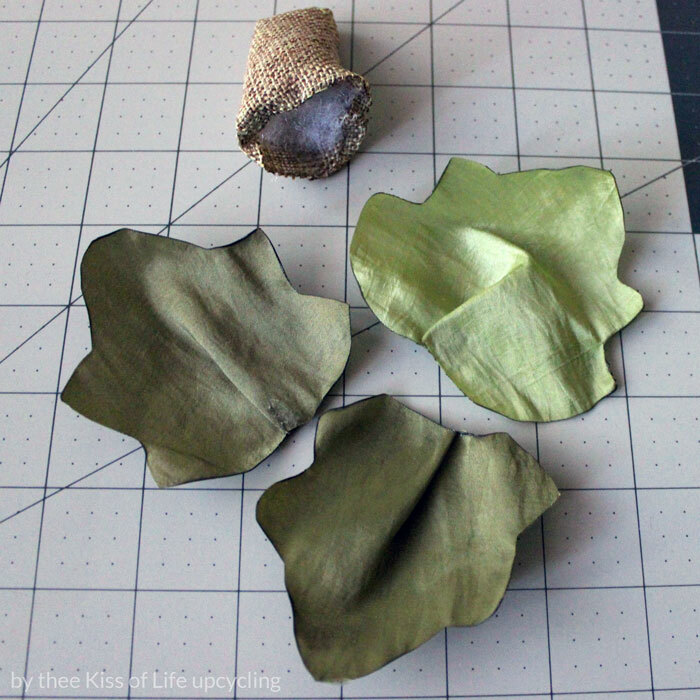 Then I singed the edges of the leaves with a candle and hot glued a little pleat on them. Also hot glued some of the stem edges inward to create a flatter base. First I glued on the leaves then the stem on top. I added some bows made out of twine for added decoration. It's not much but looks cute all together. So fabric pumpkins are pretty easy to make whether you sew or not, there are plenty of tutorials out there showing you different methods to get it done. 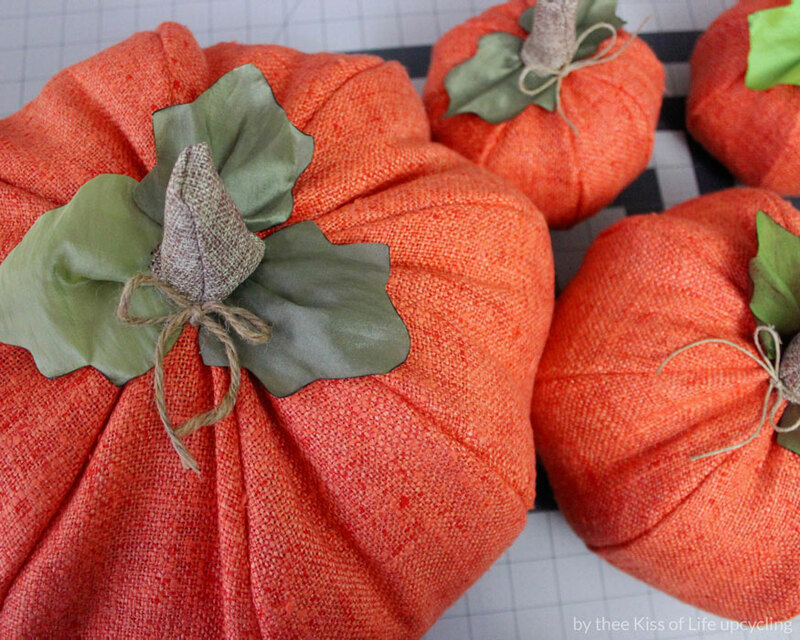 (Just search "no sew fabric pumpkins" on google or Pinterest) Real pumpkins are nice but they are one time deal, they're a fruit (yes, technically because it has seeds) and are better cooked up and eaten than wasted. Make these pumpkins and you can re-use them every autumn. Here they are sitting on the piano. 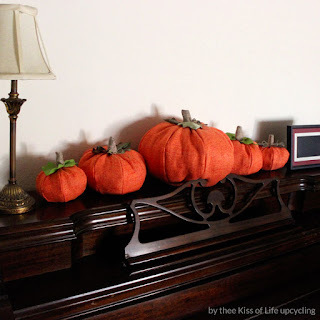 The middle pumpkin is almost too big for this spot but I like how they look all lined up. I'm thinking some wooden letters or signs would accompany them really nicely. Maybe like the words "give thanks" or even "fall" would work. I hope you give making your own reusable pumpkin decor a try.